Ophthalmology is the subject of eye and vision and its related diseases and disorders etc. If you are a MBBS student or post graduate ophthalmology student, you would need the best book for ophthalmology. And today we are going to review one of those best books, called wills eye manual pdf. There are many ophthalmology books but the one i am going to review today is a special one because it was requested by too many of our readers. When i studied it briefly, i found some great features that are descibed below. If you haven’t read wills eye manual then you should download the preview version in pdf format below and check it before buying the hard copy. But before that, you can also evaluate this book from our review and features below. 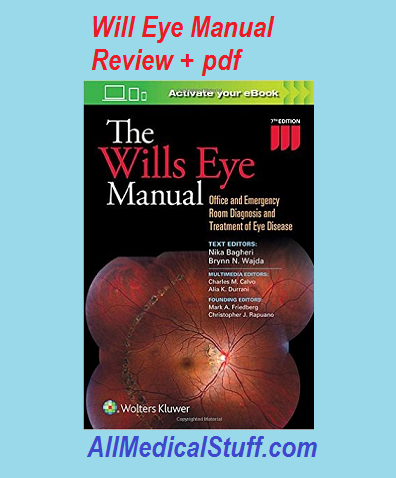 This book of ophthalmology called Wills eye manual the office and emergency room diagnosis and treatment of eye disease is written by multiple authers and the editors being Adam T. Gerstenblith and Michael P. Rabinowitz. There are many contributes of this books which shows how much effect is put into the publishing of this books and many specialists have added their part of knowledge to the book which is great for students. 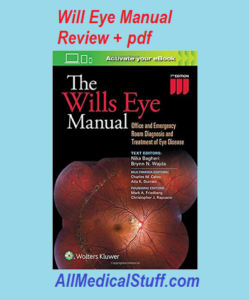 Wills eye manual has seven published editions and is a regularly updated book. This ophthalmology book has most of the good reviews of review sites and has some of the great features that are discussed below. As mentioned, this eye manual has one of the largest number of contributes as compared to other ophthalmology books which makes it so much special. This manual is written by wills eye institute which is a non-profit eye clinic and hospital in Philadelphia, Pennsylvania. In the latest edition, the results of the most important recent clinical trials are included. Eyelid lacerations, strabismus, amblyopia, orbital fractures and ocular malignancies etc are included in more detail in the latest edition. Different pictures of external, anterior and posterior chambers of the eye are added in the latest edition including fundus photos of different syndromes. Different MRI’s CT and ultrasounds biomicroscopy of eye are included in the latest edition. Different topics are highlighted in blue while proper heading are given which is quite the unique feature of will eye manual. Different Notes are given regarding important points.